The highest scoring stallion in all of the 2014 German stallion performance tests. At the auction, the beautiful bay stallion by Florencio - Sandro Hit - Donnerhall - Landadel impressed spectators with his movement and charisma, capturing the attention of many bystanders. Several guests were sure that this stallion would get a premium, but they did not notice his brand; Florenz has a Hanoverian brand, and only Oldenburg dressage horses are able to get a premium at the licensing. Though he was not awarded a premium, it is clear that he has extraordinary movement and is an exciting prospect for both breeding and sport. In 2014, he was 3rd at the Hanoverian Championships and nominated for the Bundeschampionate. He passed his 30-day performance test with the highest breeding value (calculated from performance tests) of all stallions in 2014, 157 points. His total dressage score was 9.4. He got a 10.0 (walk), 9.0 (trot) 9.25 (canter), 9.5 (rideability,) 9.38 (demeanor) and 7.75 (jumping). Florenz has an undeniable pressence in the ring; his full black coat, elastic movement, animated expression and overall allure combines beauty, talent and personality to create a complete package in this exceptional young stallion. Florenz' pedigree unites four of the best sires of recent years: Florencio, Sandro Hit, Donnerhall and Landadel. 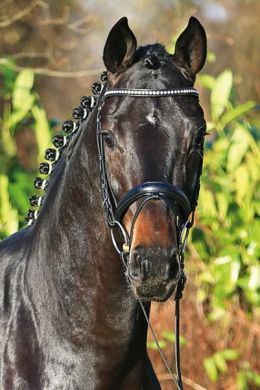 The sire, Florencio, was World Champion of young dressage horses in 2004 and 2005. Afterwards, he was sucessful in Intermediate I with Hans Peter Minderhout. His granddam, state-premium mare Donnerlady, produced the licensed stallion Sandig, by Sandro Hit. The great-granddam, state premium mare Landlady, is the dam of Lord of Loxley, by Lord Sinclair. 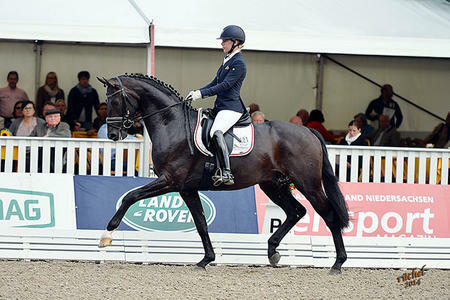 This horse is successful in international Grand Prix with Hans-Peter Minderhout. Out of the dam-line, there are the successful show jumping horses Celtas Chidambaram by Kansas (S*** with A. Kuosmanen/FIN), Show Jumper by Staron (B. Mascenti/ITA), Sinlcaire by Singular Joter (T. Utsunomiya/JAP) and Dumbledore by Drosselklang. Furthermore, the dam-line produced several licensed stallions: Law and Order, by Landadel; Atrejou, by Absatz; Graphito, by Graphit (1.50m-classes with F. Wacker); C'est la Vie, by Cor de la Bryère (1.50m-classes with H. Lugge); Pik Ayolo, by Acobat II (int. 1.50m-classes with N. Steffen/SUI); Quick Check, by Quidam de Revel; Borowski, by Brentano II; and Dynamit de Luxe, by Donnerhall.